I've been playing on stage for about an year. My setup:- Fender Stratocaster(HSS),Fender Champion 100 watt solid state amp and a bunch of pedals, a Boss GT-1 multi-FX unit. I want advice on how to use my amp to get the best monitor sound live. We get around 1-1.5k people per gig so our sound man told me to use their PA speakers instead of a direct amp. I can mic(2 SM-57s) the amp. The problem is, how do I set my monitor? Will my amp be my monitor and use their monitor to listen to the rest of the band or should I only use their monitor and keep my amp away from me while playing live so that it doesn't sound louder than it actually is in the mix? Thanks for reading. Please help. Something I've been doing lately to A.) to give the sound engineer more control over the mix versus my stage volume and B.) still be able to hear my amp without having too much of it in my monitors - obviously YMMV - is to use a stand like this angled towards me and not facing the audience. By "not facing the audience", I mean some angle between it being backwards on stage to just pointing at my side -- whatever is most convenient for your stage plot. This way, the audience isn't getting the brunt of my stage volume (which gives the sound person more control over the whole mix) and I will be able to hear myself/go deaf without slamming the monitors with guitar. This has been really helpful in situations like mine with a tube amp that sounds best with the power tubes pushed a bit -- with an AC30 that is a lot of times too much stage volume for some venues. I can still have the master volume dialed in to that kind of level and not screw up the overall mix. (You mention you're playing a solid state, so this is maybe not as much of a perk) It's not going to make my stage volume disappear, but all of the directional (read: +~567hz) frequency info is going to get a lot quieter from the audience's perspective. 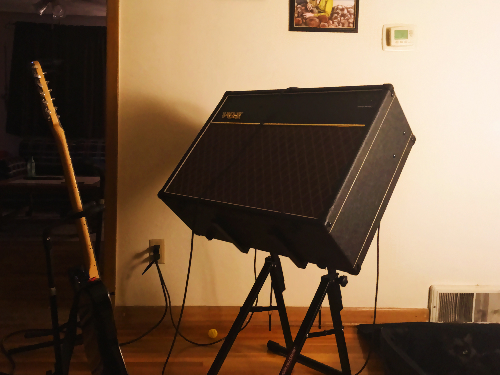 For most guitarists, their amp and speaker is part of their sound. They aren't hi-fi, they're designed to overload and distort in interesting ways. So use your own amp. But maybe you need a much smaller one. And try to point it at YOUR face, not at the back of your legs and then into the audience's faces. Direct to the board from your Boss thingy - monitor with in ears from the mix provided by FOH or with a monitor mixer at your playing position. Not the answer you're looking for? Browse other questions tagged electric-guitar live-sound stratocaster or ask your own question. Why is plexiglas(perspex) sometimes placed in front of guitar amplifiers at live shows? Can I use Keyboard amps for live monitoring?